The leader of Turkey’s opposition Nationalist Movement Party (MHP) has called on the Greek people to teach “tactless” politicians — who he accused of ignoring neighborly values — “their place”. 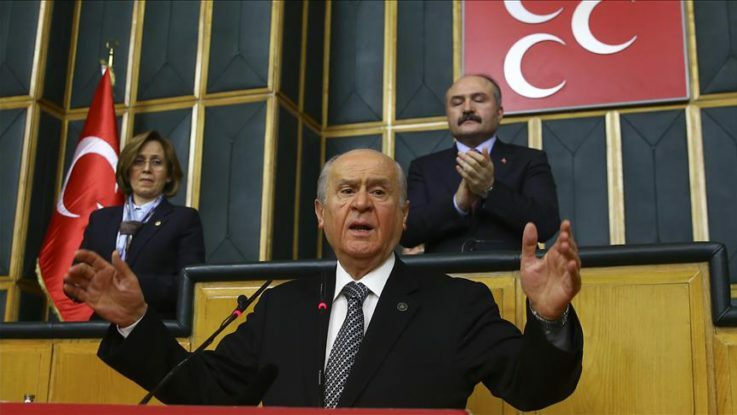 Devlet Bahceli, speaking at his party’s group meeting on Tuesday, harshly criticized recent remarks by Greece’s defense minister on the Kardak islets in the Aegean Sea. “The Greek people should warn their administration and teach the tactless, who ignore neighborly values and are waiting to see a crisis arise, their place,” he said. Panos Kammenos claimed Friday that Turkey was trying “to escalate the crisis” over the Kardak islets, warning against setting foot on them and saying Greek forces were ready for “any contingency”. Turkish Foreign Minister Mevlut Cavusoglu responded Sunday by saying that while Ankara places importance on relations with Athens, “Greece should not allow a spoiled child to cast a shadow over this” — apparently referring to Kammenos. “They should not try our patience,” he said. On Tuesday, Bahceli said Cavusoglu had given a “good” response. A decades-long dispute between Turkey and Greece over the uninhabited Kardak islets brought the two countries to the brink of armed conflict in 1996 and led to renewed tensions this year. On Jan. 29, Turkish military chief Gen. Hulusi Akar visited waters near the islets. Three days later, Kammenos flew over them. Bahceli also commented on recent tension between Turkey and the Greek Cypriot administration over a controversial legislation to commemorate the Enosis referendum of 1950. The Greek Cypriot parliament voted on Feb. 20 for the annual commemoration of the 1950 referendum in which 96 percent of Greek Cypriots voted for the island to be annexed to Greece. Turkey will “never leave” the Turkish Republic of Northern Cyprus, Bahceli underlined.